Decreased strength in serratus anterior (SA). Overactivity and early activation of upper trapezius (UT). Decreased activity and delayed activation of lower (LT) and middle trapezius (MT). When designing rehabilitation programs for the shoulder it is important to consider the functional requirements of the patient and determine if closed or open chain movements are most applicable. One of the limitations of many traditional scapula exercises is that they are done on the floor and to progress our clients to higher levels of rehabilitation we need to be thinking of functional positions and getting them into standing. 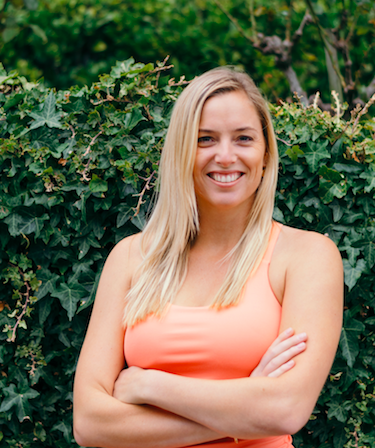 The most common mistake that I see in shoulder rehabilitation is that patients are told their upper traps are overactive and that they need to position their shoulder blades 'back and down'. This correction is fine if your patient never needs to raise their arms above 40 degrees flexion or elevation. What is missing in their rehabilitation is the education that scapula upward rotation is a vital component of shoulder elevation. It seems more and more that I am spending time with clients teaching them about scapula setting in weight bearing using serratus anterior and educating them about the role of upward rotation in higher degrees of shoulder elevation. 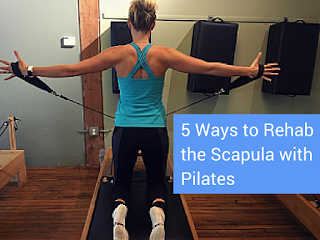 The purpose of this blog is to recap which physiotherapy-centric exercises are recommended in scapula rehabilitation and offer suggestions on how these translate into the Pilates setting. The low row is an exercise that targets SA and LT activity, shoulder external rotation and scapula posterior tilt (Kibler., 2008). You can retrain the low row in standing, prone lying or kneeling on the reformer. This low row movement has also been shown to promote LT activity when compared to UT activity, and therefore is a great exercise for patients with UT overactivity symptoms. The robbery is another exercise that promotes SA and LA activity but in the position of scapula retraction, shoulder abduction and external rotation. If you're looking for a more complicated version of this movement you can place the ropes around the elbows, which removes stability from grip strength and challenges the scapulae further. I really love performing these exercises in kneeling as they require the patient to balance with optimal hip, pelvic and lumbar spine alignment before strengthening their shoulders. 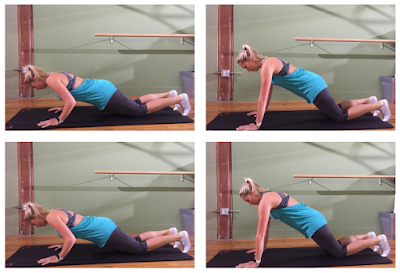 Closed chain exercises that promote SA and LA activity which are commonly used in rehabiliation are the push up & push up plus. There are many variations of a push up i.e kneeling, a full push up position and in standing. Interestingly, if you perform a kneeling push up and extend the same leg as the affected side, there is an increase in LT activity, compared to extending the opposite side, which promotes SA activity (Maenhout, et al., 2009). Using this knowledge about SA and LT activity in a closed chain position I created these two 4PK reformer exercises. Each are performed on a very light weight (either one yellow or blue spring). It is a great way to challenge hip and scapula control in weight bearing and also upward rotation on the moving arm as it glides in and out of each over head movement. Here are the other shoulder exercises that you can perform in kneeling on the reformer to train retraction, horizontal extension or flexion control. And some combined movements to finish off with. As you can see, there is a very smooth transition from the initial exercises into more functional positions. 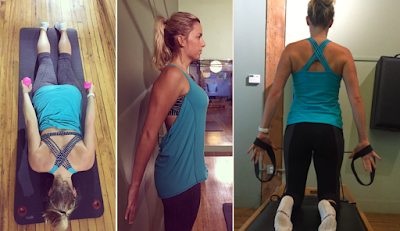 What I love above the reformer is that you can easily vary the resistance and base of support. You can choose to position your patient in sitting, kneeling or half kneeling depending on your kinetic chain goals. Cools, A. M., Declercq, G., Cagnie, B., Cambier, D., & Witvrouw, E. (2008). Internal impingement in the tennis player: rehabilitation guidelines. British journal of sports medicine, 42(3), 165-171. Cools, A. M., Dewitte, V., Lanszweert, F., Notebaert, D., Roets, A., Soetens, B., ... & Witvrouw, E. E. (2007). Rehabilitation of Scapular Muscle Balance Which Exercises to Prescribe?. The American journal of sports medicine,35(10), 1744-1751. Decker, M. J., Hintermeister, R. A., Faber, K. J., & Hawkins, R. J. (1999). Serratus anterior muscle activity during selected rehabilitation exercises. The American journal of sports medicine, 27(6), 784-791. Kibler, W. B., Sciascia, A. D., Uhl, T. L., Tambay, N., & Cunningham, T. (2008). Electromyographic analysis of specific exercises for scapular control in early phases of shoulder rehabilitation. The American journal of sports medicine, 36(9), 1789-1798. Maenhout, A., Van Praet, K., Pizzi, L., Van Herzeele, M., & Cools, A. (2009). Electromyographic analysis of knee push up plus variations: what’s the influence of the kinetic chain on scapular muscle activity?. British journal of sports medicine. Watson, L. A., Pizzari, T., & Balster, S. (2010). Thoracic outlet syndrome part 2: conservative management of thoracic outlet. Manual therapy, 15(4), 305-314.